Presumably shamed by the rise of starving families and food banks in the UK under their watch, Tory MPs have taken to openly lying to parliament to save face. As an example of this, Conservative MP for Morecambe David Morris shamelessly told parliament that he had never been invited to visit one of the local food banks in his constituency when in fact he had been invited 4 times. 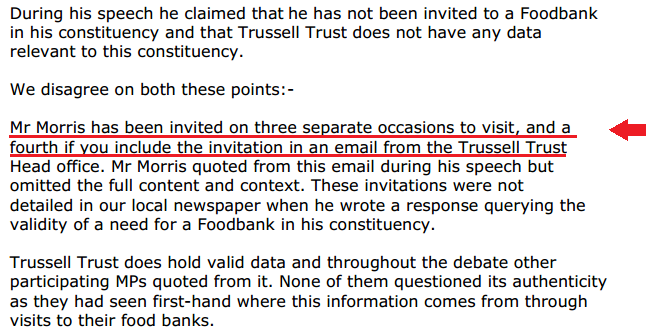 Morris also told parliament that food banks do not hold local information, which is also a lie. You can read the full statement from Morecambe Bay Foodbank here. Of course, if Morris had any honour, he would immediately apologise to members of parliament for his barefaced lies to them. But don’t go holding your breath. I am holding my breath … Perhaps I’m expecting something exciting to happen. No, not yet. Tory MP lies? I was writing stuff on that for “Pivate Eye” when you may have been still in nappies. I have just forwarded your piece to the disreputable Tory liar, Morris, for him to read; I did write that I’ve been a staunch Conservative voter all my 60+yrs (I wouldn’t vote Tory if my life depended on it – so, it’s not just that cretinous git that tells porkies?? ), and that I, and many of my friends, would never vote for them again due to this Government’s ability to lie and deceive the public, constantly…….Thought by adding that piffle to the e-mail it may draw a reply from the ****, I doubt very much if it will, though? Keep on posting your blog, my friend; the public needs people like you to keep them/us informed. Just received this………I wonder if it will draw a reply? Thank you for contacting David Morris MP. Your communication is receiving David Morris’ attention and you will receive a reply as soon as possible. We aim to reply to Emails within 2 weeks, but if the matter is urgent, please call 01524 841 225. If you are a constituent, please ensure that you include details of your full home address. Please note that you will NOT receive a reply unless we have this information. The reason we need this is because it is a strict Parliamentary convention that MP’s do not become involved in corresponding or dealing with issues that are raised by persons who do not live in the area they represent. This is just one more attempts by the Tories to deny that food banks are necessary. It follows similar statements by government ministers and has-been like Edwina Currie, who maintain that no-one’s really starving and that people only go to them because they’re offering free food. It’s a lie, from a party that’s so crooked that like Richard Nixon they have to screw their pants on in the morning (joke copyright Hunter S. Thompson). At one level, food banks are exactly what the Tories wanted. They wanted to cut public provision down, so that people would be forced to rely on private charity. This was held to be more efficient, more moral, because unlike state charity it’s voluntary, and would also strengthen religious organisations like the churches. What they don’t like is that the proliferation of food banks shows just how huge the hardship created by their austerity policies are, and that despite the propaganda of more ‘jobs than before’, and ‘Britain on the road to recovery’, an increasing number of Britons are living below the breadline. And they just can’t stomach that. hence the denials that they’re necessary. Corruption, dishonesty and barefaced lies are synonymous with the nasty party. It’s popular among lying MPs to claim that they may have forgotten that they had been invited, and of course in true Goebbels tradition, the bigger the lie the more gullible people are likely to believe it. what bugs me is that they think they are Clever, better than us. They base their Messianic self beliefs on social darwinism and and using the theory of Eugenics to convince themselves they are right. Reality however is like looking in the Mirror, (not the paper). For all ltheir privilege and Education, they are unable to Think outside their own narrow box, or even imagine they could in time , with much psychological Intervention and Direction rejoin the Human Race. Shared with ‘Mr Shouty Call Me Dave’. The Tories and Liberals (now called Lib Dems) did the starving of people with the workhouse and the New Poor Law that forbade feeding the starving back in the 19th Century. The parties before the 19th century, have always left the poor to starve throughout UK history. The Tories and Lib Dems have been economical with the truth about the flat rate pension, now, amazingly, proved by right wing newspapers The Daily Telegraph and The Daily Mail, who have gleaned the information from formal government calculations, Freedom of Information requests read by pension experts and people’s own flat rate state pension forecasts when retiring next year. The current £113.10 state pension is far, far below the breadline, and for 2.6 million pensioners this is their sole income in old age. Their ‘foodbank’ is the charitable weekly or monthly free over 60s lunch clubs. The flat rate pension either leaves people with NIL STATE PENSION FOR LIFE or grants forecasts for next year’s claimants of as little as £55 per week all in. This affects about 2 million workers in their late 50s / early 60s today. Affecting people older than the women denied state pension at 60 from 2013 (claimant years starting 2019-2020) , but affecting the men denied state pension at 65 from 2013, who might have state pension payout year in 2016 as raised to 66 – 67 – 68. I don’t think I can honestly recall when any tory politician didn’t lie – that’s the truth! Today, the All Party Parliamentary Group (APPG) for Hunger and Food Poverty reports on the reasons behind the growth of food banks in this country, and makes recommendations of how we can move forward to tackle 21st century hunger. When we launched our inquiry in April this year, the food bank debate was mired in party political rhetoric. Food bank statistics were being used as ammunition in an unseemly battle in what is an extremely emotive policy area. This mode of discussion prevents a full and dispassionate assessment of the complex reasons people turn to emergency support in a crisis. The APPG took evidence from over 150 people, in Parliament and in sessions around the country. Our principal recommendation is to establish a new body known as Feeding Britain, which will provide better co-ordination amongst civil society, Government departments and supermarkets – which struggle to make effective use of the enormous food surpluses they generate. This would make a practical difference to the food banks which have become embedded in many local communities as the first port of call in a crisis. We want to ensure they have a sustainable supply of food, are linked to other services that will be able to address underlying issues, and enable a healthier dialogue to take place between Government departments and political parties. Broadly, we found it is possible to define two categories of food bank usage. Firstly, there are those who are coping on a low income for a long time, who live “hand to mouth” and therefore have insufficient financial resilience to cope when the car or the boiler breaks, or when unemployment hits. Secondly, there are those who have more complex underlying needs – who are struggling with extensive debt, health or addiction problems, and who rely on the state for income and support. We need to acknowledge the lack of financial buffers amongst the lowest earners in society. For those on a low income, it is critical to continue to make sure they can keep more of the money they earn. Our Government has made significant strides in this direction by taking 3.2 million of the lowest paid out of tax. A future Conservative Government should go further, and work towards delivering our commitment to take those working full-time on the minimum wage out of tax altogether, and to ensure that we support savers. But we should also remember to make the case for a strong economy that distributes prosperity fairly. Despite an unprecedented unbroken period of economic growth up to 2008, Britain still experienced the highest rate of inflation amongst similarly advanced western economies between 2003 and 2013. During this 10 year period Britain saw the highest inflation across food, fuel and housing – wages grew by just 30 per cent in this decade; but the cost of food alone rose by nearly 50 per cent. Our report shows that for the poorest 10 per cent in our society, the amount of their income spent on food, utilities and housing rose from 31 per cent in 2003 to 40 per cent in 2012. Clearly, this leaves considerably less in household budgets to deal with unexpected expenditures. Reducing the use of food banks for low earners will not happen overnight. It requires a sustained long-term economic plan that bears down on the cost of essentials. We are now beginning to see the fruits of growth: food inflation this year fell to an annual rate of -0.6 per cent: the first time it has fallen since 2006. Average earnings for those in continuous employment rose by more than double the rate of inflation last month: the start of “real pay growth” according to the Governor of the Bank of England. Our childcare reforms will also save low income families up to £500 each month. We also need to talk about welfare. Our existing welfare system will benefit from the specific changes already in delivery to make it more responsive to people’s unpredictable lives. Universal Credit is not an easy reform, but the evidence we heard underscored the clear case for it to be successfully and fully implemented. We make some suggestions of how the administration and delivery of benefit decisions could be enhanced further. As I reported in my joint submission with the Trussell Trust, the hardship caused by any changes in benefit payments is not a new phenomenon: in 2006/7, benefit delays accounted for 34 per cent of referrals to Trussell Trust food banks; in 2013/14 it accounted for 31 per cent of referrals. It is not so much about the amount being paid, but needing to ensure that all that can be done is done to remove the gaps in payments as life changes are “processed” by the state. As Jack Monroe told the Inquiry in July: “if my benefits had been paid quickly, in full and on time I would have been able to meet my living costs”. DWP can point to significant improvements: 92 per cent of claims are now processed on time (up from 86 per cent in 2009/10), but clearly there is more to do in this respect. For those who are not processed in a timely manner this is not a statistic but a personal crisis. Food banks are beginning to respond to the wider needs of the most vulnerable: we heard about debt advice, cooking classes and welfare support services alongside food parcels. Civil society will inevitably be able to offer a more personalised and less time-constrained approach to welfare than the state can – but we want to embed partnership working to ensure that the best overall provision into the future. So this fearless govt will do blah and even more blahblahblah till this country is rescued from socialism forever and we rebuild the British Empire .GOD SAVE THE CONSERVATIVE PARTY AND DAVID CAMERON OF WHICH GOD SENT HIM TO US FOR OUR SALVATION…btw blah. Irrelevant whether he’s been invited or not. If he felt that concerned he would make arrangements to visit HIMSELF, or just turn up. Does he really need an “invite”? I constantly write to this Tory Moron on various subjects at least once a month and all I get in reply is the party rhetoric … He is a liar, well after all he is a Tory & that is what they are ALL good at. How he and any Tory can sleep at night is beyond me and yes I HAVE been to the foodbank in Morecambe taking food unlike him who claims extortionate expenses at the expense of the poor in his constituency.